"From the secret archives of the Comptrollerate-General for Scrutiny and Survey. Summer 1914: Europe is on the brink. As Britain's enemies grow stronger, the Comptroller-General must confront the man with whom he has struggled for a generation - a man he knows only as the Spider. In a desperate gamble, he sends four agents out across the continent, on a mission they do not"From the secret archives of the Comptrollerate-General for Scrutiny and Survey. Summer 1914: Europe is on the brink. As Britain's enemies grow stronger, the Comptroller-General must confront the man with whom he has struggled for a generation - a man he knows only as the Spider. In a desperate gamble, he sends four agents out across the continent, on a mission they do not understand...The future of British intelligence - of the British Empire - is in their hands. Not all of them will return. Unique and resourceful, hunted and deceived, they have embarked on a journey that will climax in the town of Sarajevo on the 28th of June 1914." This is such a clever read, just as you'd expect from the author of the superb Traitor's Field. This time, the historical spy thriller moves its focus to the months immediately preceding the outbreak of World War 1. Ingenious, witty and surprising throughout. Wow! Really exciting. Very subtle, and really intellectually challenging. I hope I didn't miss any of the plot. I loved how you got the feeling it could all really have happened.If you like the style of Wolf Hall, you will like the vivid and impressionistic way of describing the action - and there is a lot of it! Rather Bond-ish with (I guess) House of Cards elements. I had not read the first 2 - so will be on the lookout for them. 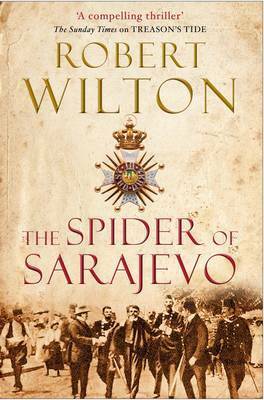 The third in Mr Wilton's series and the third I have read with great enjoyment. Perhaps a modern day Buchan?